Thank you, form has been submitted. With its modern, geometric contours and smooth curves, Cami is a study in harmony. A flatware pattern for those who are looking for contemporary style and classic warmth, this oversized Oversized pattern works well with larger plates and simple place settings. Like all Gourmet Settings patterns, Cami has been meticulously designed, engineered and tested to be perfectly weighted and balanced, ensuring optimal performance and comfort you have to feel to believe. Cami is made with premium stainless steel and is guaranteed to last for years to come. We source the best raw materials in order to make the highest quality flatware at a reasonable price. 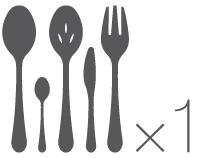 All our flatware is dishwasher-safe, premium stainless steel and comes with a 25-year warranty. We have unparalleled customer service. We believe all of our customers deserve a first-class experience. We’re here to help. Really! Stay in touch and you’ll be the first to hear about great deals and new releases. We promise not to be annoying.